The Glowlight Tetra is a beautiful fish with a glowing orange stripe across the center of its body! The Glowlight Tetra Hemigrammus erythrozonus derives its common name from the iridescent reddish-orange stripe down the fish's side. A school of these attractive fish will catch the eye of even the most seasoned aquariast. As these fish get older, the stripe becomes more and more pronounced. They get more and more beautiful with time! This characin is one of the most peaceful tetra species. Like other tetras, they are schooling fish and will do best in groups of 5 or more. A group of this size will need a tank that is about 15 gallons or more. The Glowlight Tetra makes a great addition to a peaceful community tank. Good tankmates include other tetras, danios, rasboras, and most gouramis. They can also be kept with peaceful bottom dwellers. This durable little fish adapts well to a variety of conditions and is easy to breed, making it a great choice for the beginning aquarist. These fish are most comfortable in an aquarium with loose floating plants to help dim the light, but they need some open spaces to swim as well. They are not prone to overeating, but they do like to eat a small amount of food several times a day. It is best to feed them what they will eat in about 3 minutes or less, ideally 3 or 4 times a day. The Glowlight Tetra Hemigrammus erythrozonus was described by Durbin in 1909. This species is not listed on the IUCN Red List. They are found in South America in the Essequibo River of Guyana. The Essequibo is the longest river in Guyana and has many different biotypes throughout. The Glowlight Tetra is normally found in the heavily forested tributaries off the main river channel where the water is stained dark brown from decaying material and is highly acidic. These fish swim in schools and feed on worms, small crustaceans, and plants. Finding a wild-caught Glowlight Tetra for sale in the aquarium trade would be difficult to impossible. Instead, these fish are mass produced for sale. 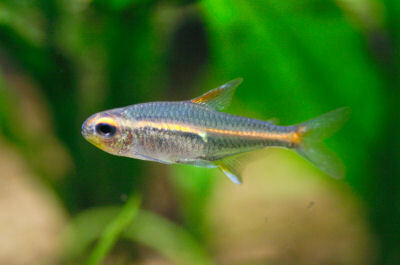 The Glowlight Tetra is a small, slim-bodied species of tetra. This fish will reach about 1 1/2 inches in length (4 cm) and have a lifespan of about 2 to 5 years in the aquarium. It is similar in appearance to the Black Neon Tetra with its horizontal stripe that seems to glow, but these are distinctly different fish. The Glowlight Tetra can be readily identified by its transparent body and its stripe, which gets more and more pronounced as the fish gets older. Lifespan: 5 years - It can have a lifespan of 2 to 5 years. The Glowlight Tetra is a hardy fish that is good for the beginning fish keeper as long as its tank is well maintained. This fish does well in a variety of conditions and can be bred fairly easily. This is a great characin for newer fish keepers who want experience breeding fish. Since they are omnivorous, the Glowlight Tetra will generally eat all kinds of live, fresh, and flake foods. To keep a good balance, give them a high quality flake food every day. Feed brine shrimp (either live or frozen) or blood worms as a treat. As with most tetras, these fish prefer to eat several times a day. Only offer what they can consume in 3 minutes or less in each feeding. Glowlight Tetras are easy to care for provided their water is kept clean. Aquariums are closed systems, and regardless of size, all need some maintenance. Over time, decomposing organic matter, nitrates, and phosphate build up and water hardness increases due to evaporation. To combat these ever-changing conditions, water should be replaced on a regular basis, especially if the tank is densely stocked. At least 25 to 50% of the tank water should be replaced every other week. The Glowlight Tetra will do best in schools of 5 or more, so they need an aquarium that is at least 15 gallons or larger. This very undemanding species will tolerate a wide range of conditions, but they do best with soft light and peat-filtered water. To simulate the black waters that they come from, add a mesh bag of aquarium-safe peat to the filter. Lighting should be dimmed by adding some floating plants. A biotype setup is the best choice for this tetra and is very easy to put together. The substrate should be made up of river sand. Provide some driftwood branches and twisted roots for decor and to create areas of retreat. Some dried leaves can be added to stain the water and give the aquarium a natural feel. Leaves should be removed and replaced every few weeks. Their natural habitat does not have many plants, so it is not necessary to include them. Lighting Needs: Low - subdued lighting - Low lighting in a darker tank setup will bring out the best iridescence of this fish. Glowlight Tetra are generally a good community fish. They will do best kept in schools of 5 or more. Good tankmates include other livebearers, danios, rasboras, other tetras, most gouramis, and peaceful bottom dwellers. The female is larger and stronger than the male and has a round ventral section. The male is more slender and more colorful than the female. Glowlight Tetras are egg layers. When they spawn, they lock fins. Then, while clasped, they perform a type of roll-over process in the vegetation. As they do so, the female releases about a dozen eggs at time, and the male fertilizes them. Because of this spawning behavior, this tetra's spawning vegetation must not be too dense. A separate breeding tank, about 10 gallons in size, will help to get the best number of fry. The most successful way to spawn these fish is in groups of 12 with 6 males and 6 females. Feed this group small live foods, and nature should take over and spawning will begin. Keep the tank dimly lit with clumps of spawning mops or java moss, so the female has a place to deposit the eggs. A layer of mesh also works as long as the spaces are wide enough for the eggs to pass through but small enough to keep the parents out. The water should be soft and acidic with a pH of 5.5 to 6.5 and a temperature of 80 to 84° F. A small, air-powered sponge filter is all that is really needed for filtration. Filtering the water through aquarium-safe peat is a good choice. Once a successful spawn has been achieved, remove the parents. Eggs will hatch within 24 to 36 hours, and fry become free-swimming 3 to 4 days later. For the first few days, feed the fry infusoria-type foods until they can feed on microworm or brine shrimp nauplii. Fry are light sensitive during the early stages and require their environment to be as dark as possible. See Breeding Freshwater Fish: Characins for a general description of breeding processes, and see Fish Food for Fry for information about types of foods for raising the young. The Glowlight Tetra will resist disease as long as it is provided with a stable environment. In an unstable tank, it will die off very quickly. A good thing about this tetra is that due to its resilience, an outbreak of disease can often be limited to just one or a few fishes if dealt with at an early stage. With other species, it is common for all fishes to be infected before the first warning signs can be noticed. The best way to proactively prevent disease is to provide the proper environment and a well-balanced diet. The more closely their environment resembles their natural habitat, the less stress these fish will have, making them healthier and happier. Stressed fish are more likely to acquire disease. The worst fear of a tetra keeper is the Neon Tetra disease, an essentially incurable and a highly contagious disease of unknown origin and cause. It was first diagnosed in Neon Tetras, and so earned its name, but it can actually affect many other species. The Neon Tetra Disease has been identified as a microscopic sporozoan in the genus Plistophora. It shows up on the fish as a spreading spot or blemish beneath the dorsal fin. Attempts to cure this disease with the use of Methylene Blue have not always been successful, so the disease is considered incurable. This disease has also been spotted on the Neon Tetra Paracheirodon innesi and the Rosy Tetra Hemigrammus erythrozonus. As with most fish, this tetra can be prone to skin flukes, parasitic infestations (protozoa, worms, etc. 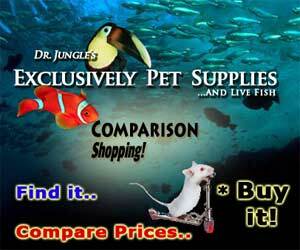 ), ichthyobodo infection, parasitic infestations (protozoa, worms, etc. ), bacterial infections (general), and bacterial disease. Aquarists should read up on common tank diseases. Knowing the signs and catching and treating them early makes a huge difference. For more information about freshwater fish diseases and illnesses, see Aquarium Fish Diseases and Treatments. The Glowlight Tetra is readily available and moderately priced. Those fish are so cool when they turn arund. Check out Animal-World information on Fish Diseases and Treatment. They specify a disease where the cloudy eye is a symptom and recommended treatments.